Original Article: "Shaw’s Crab House Celebrates the 30th Pearl Anniversary of Oyster Fest"
Oyster Happy Hour is available all day, every day throughout Oyster Fest. 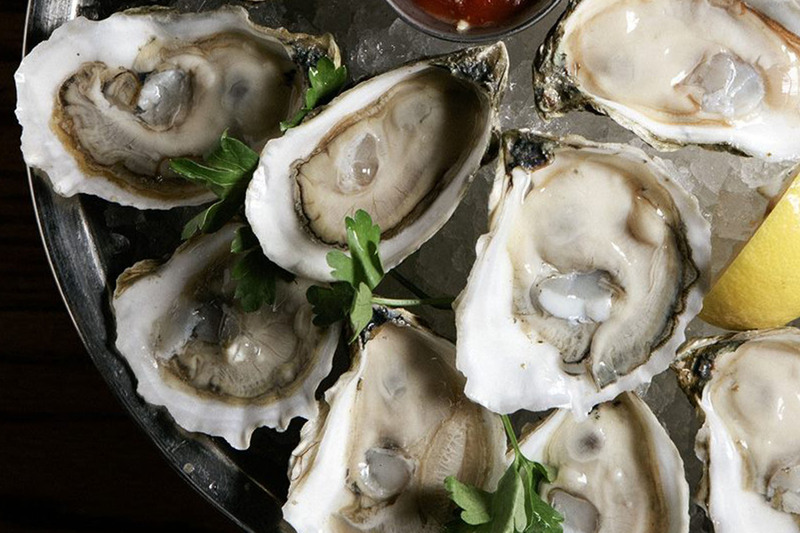 Enjoy half-off one East Coast and one West Coast oyster from open to close in the Oyster Bar. Special dishes for Oyster Fest including Blue Crab Stuffed Oysters, Fried & Grilled Oysters, Po’boys and more to celebrate all things oyster. Shaw’s Crab House is offering surprise .50 cent oyster hours throughout the week that will be announced exclusively on their social media pages. Follow along on Instagram @shawsoysterfest and @shellyfromshaws to find out when each .50 cent oyster hour will take place. Enjoy live, blues music every night of Oyster Fest in Shaw’s Chicago’s Oyster Bar from 7 PM -10 PM. A tap party to celebrate the restaurant’s first exclusive beer, the OB Tripel which was created in collaboration with Oyster Beer Co. and specially designed to pair with oysters. The brew is available for half off from 4 PM – 10 PM at both Shaw’s Chicago and Shaw’s Schaumburg. Dine for weekend brunch during Oyster Fest and your next brunch at Shaw’s is just $30. Gift card restrictions apply. Hours and dates vary per location. The Oyster Roast and Fried Chicken Dinner features a special menu of roasted oysters, fried chicken, comfort sides as well as an interactive “How to Shuck an Oyster” class. Chef Donny Farrell, Executive Chef at Oyster Bah and creator of Four Letter Hot Sauce will demo how he makes his homemade hot sauce. The dinner starts at 6 PM and is $49 per guest plus tax (gratuity not included) which includes two beverages. Slurp-off competitions are taking place throughout the week starting at 6 PM. The top two finalists from slurp-offs on Monday, October 8 – Wednesday, October 10 will continue on to the Final Slurp-Off on Thursday, October 11. The Slurp-Off Winner will receive a one night stay at “Pearl in the Park,” a luxury Lincoln Park apartment, dinner for two at Shaw’s Crab House Chicago (up to $250 value excluding tax and gratuity), brunch for two at Oyster Bah, and two tickets to the Art Institute of Chicago. Sign up by calling 312-527-2722. Shaw’s Crab House is joining forces with Shedd Aquarium to celebrate sustainable seafood with a special five-course dinner on Wednesday, October 10 at 6 PM at Shaw’s Chicago. Executive Chef Arnie Tellez and Sommelier Steve Tindle are teaming up to create a menu that showcases our long-standing relationships with the purveyors who have provided the team sustainable seafood and wines for over three decades. This event celebrates the kick-off of Lettuce Entertain You’s company-wide initiative to go strawless and to officially join the #SheddTheStraw campaign. The dinner is $95 per person plus tax (gratuity not included) and a portion of the proceeds will be donated to Shedd Aquarium to support their conservation efforts to protect the health of our lakes, rivers and oceans for the wildlife and people who depend on them.